Should IBD Patients Look To Mouse Studies For Hope? Aww, the poor mice. 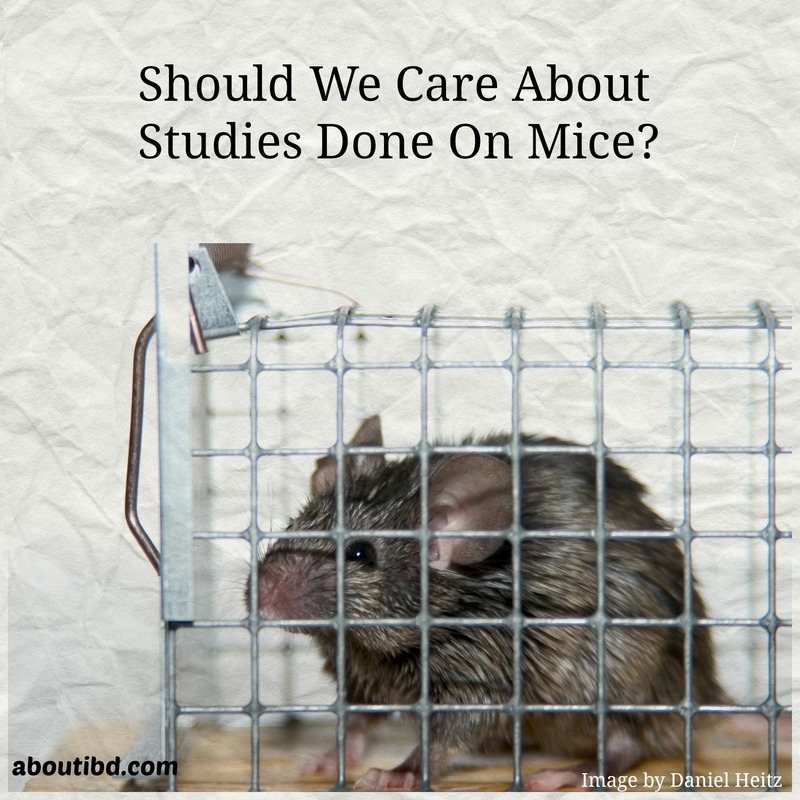 Mice studies are important because they are a first step. But they’re just that — preliminary results that may or may not lead to something meaningful for patients. I often make a joke that when I see a study done on mice or rats my eyes glaze over and I move on. I don’t, really, of course. I read them and will watch future research to see how things pan out, and if more study moves the knowledge further and leads to anything significant. However, I don’t usually write up a summary or include it in an article as a reference. This is because I’ve learned that most people aren’t interested in reading about mice studies. The other reason that I don’t often report on them is because they often don’t lead to anything. The mainstream media, however, often gloms on to these stories as if they’re going to change everything for patients. But they don’t, at least, they won’t for a long time. What really is important for patients to know is that mainstream media often doesn’t cover IBD in any significant way. That doesn’t mean they can’t summarize a research study, but they often overinflate its importance to sell papers or magazines, to get clicks on their web site, to get reTweets or shares on Facebook. This has been going on for years, of course, but recently I have seen it taken to egregious levels. One study done on mice showed that mouse mothers may pass a bacteria on to their mouse babies, and that this bacteria may have a role in the development of IBD. Great. Fine. Let’s see where it leads! But more than one media outlet reported it widely, and used photos of human mothers and children to promote the story. The study was done on mice! These irresponsible editors showed a mother kissing her baby and purposefully used a misleading headline that did not mention mice at all. Only after you click do you see that it was a mouse study, and we don’t yet know how this will affect humans. The problem is significant. What they said was that mothers kiss their babies and that the bacteria transferred from a kiss gives the babies IBD. The study did not say that. There is no research to support that. It is currently known to be only happening in mice. So now we in the IBD community once again have a myth that is going to be transferred and seep into the public consciousness: that mothers give their babies IBD. (Which is not proven!) This is just a mouse hop away from saying IBD is contagious. (Which is also not proven! In fact, it was disproven!) How long before people tell us not to kiss our children? Or say we shouldn’t have children at all? Many people with IBD are already voluntarily childless because of a fear of passing on the disease. Others deal with fertility issues resulting from medications and surgery and may want biological children but are unable to make that happen. You may think this means that I don’t put value in studies done on mice or rats or fish. Obviously this research is important and it is the first stepping-stone to knowing more about a great many diseases and conditions. It needs to be completed so that we can move on to human studies. But not every study done on a mouse leads to something significant and important. After all, while mice obviously are different than humans, we shared an ancestor some 80 million years ago. It just makes sense to do research this way. But we have to move past it to get to anything that is clinically relevant to humans. What do I mean by “clinically relevant”? I read some study done on mice and how it relates to IBD. I think it’s promising, so I ask my doctor about it. We can have a theoretical discussion about it, but it’s not going to change the recommendations she gives. (Believe me, I’ve tried.) It’s not going to change my medication or my diet or anything about my day-to-day life. It may take 10 or 20 years before this study done on a mouse or a zebrafish yields anything that will change medicine — if it does at all. So, do you really care about it? Maybe you are interested as an expert patient, and I encourage everyone to read original research papers and learn as much as they are able. I also encourage you to be very wary when reading reports from media sources that often ignore IBD. The only time we are in their sights is when some study yields controversial results and will get them attention. What about our day-to-day problems? What about the debt that follows so many of us? The repeated hospitalizations? The surgeries? The expensive and side-effect riddled medications? No, of course, they’re not reporting on that. That won’t get clicks, will it? That won’t rile anyone up and get them reading. Which is why we need to keep reporting on the important part of IBD — what it does to people’s lives, and why we need funding for the mouse studies and why we need them to be reported accurately. This entry was posted in Advocacy, research on February 27, 2015 by Amber.